Add a photo or image to a Messages email. In order to add a photo or image to a Messages email, You're going to need to learn a little coding. Don't worry, I'm not an engineer either! I promise you can do this:) If you need help, just open a live chat and we can help you out. For this example we are going to add a company logo to the message. Step 1: Upload your logo or images to the File Vault. Click the "share" button and paste the link into a text document. You'll need this link in a few minutes. Don't delete this file. If you delete the file, the image will not show up in peoples email. Step 3: Click the </> button in the Messages tool bar to open the code editor. If you look closely, you will see all the text you wrote surrounded by code. 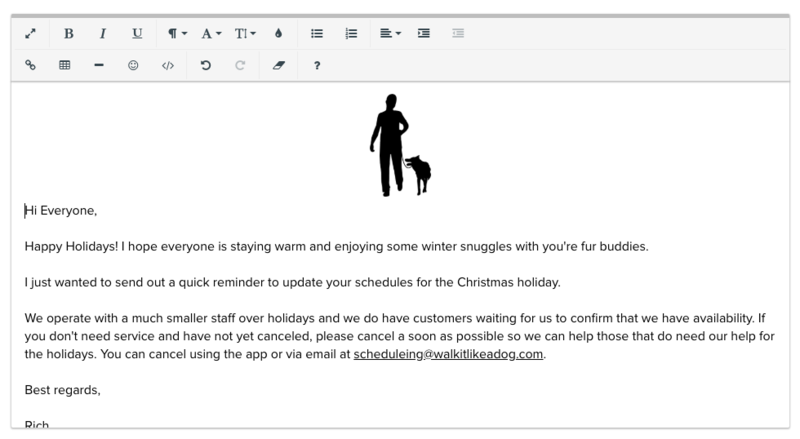 Place you cursor at the very beginning of the email, before the first <DIV>, hit enter twice to give yourself some room to work. Then, move your cursor back to the top of the editor. Copy and Paste the following string into the code editor. Replace YOUR FILE VAULT LINK GOES HERE with your full File Vault link (Step 1) including the https part. Also KEEP THE QUOTATION MARKS around the link. Tip: Change the image size by increasing or decreasing the width from 100px. Tip: Before you send an email to your customers, send a test email to yourself and see how it looks on both desktop and mobile. Click </> button to preview the image in your text editor. If you want to add an image to the middle of your email, just add the code where you want it to show up. I can add an image below the introduction "Hi Everyone," and wrap the text around it.